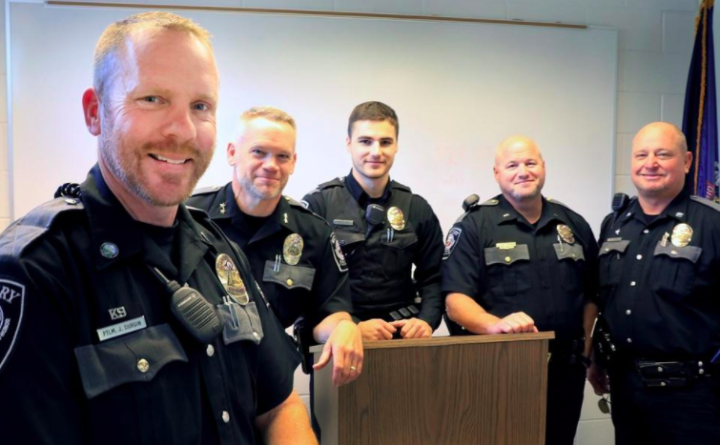 Kittery police officers, from left, Jay Durgin, Chief James Soucy, Ben Cyr, Lt. John DesJardins and Robert Byrnes. KITTERY, Maine — Local police have rallied a dozen restaurants and bars in town to give a thumbs up to designated drivers. The Kittery Police Benevolent Association and Police Department launched a designated driver awareness program for June. Participating establishments are the Black Birch, Blue Mermaid, Navy Yard Bar and Billiards, the Pointe, Farm Bar and Grill, Corner Pub, Loco Coco’s Tacos, Maine Beer Cafe, Weathervane Seafoods, Woodland Farms Brewery, Robert’s Maine Grill and Rudders Public House. During June, designated drivers who identify themselves to their server or bartender will be served free non-alcoholic drinks all night in a Kittery Police Benevolent Association pint glass. The program is the start of an effort by Kittery police to focus on a different community topic each month. Future topics include speed, emergency management and car seats, for example, according to community police officer Brian Cummer, who is spearheading the initiative. Each establishment that agreed to participate did so without hesitation, Cummer said, and many said they’ll decide to offer the glass initiative year round. “This is truly a partnership that helps to build positive relationships between the police department and the responsible establishments in our community and to keep people safe,” Cummer said.